Rear Admiral The Hon Justice MJ Slattery RANR on 10 November 2016 tells the story of Brigadier General Henry Normand MacLaurin. General MacLaurin was Comd 1 Bde at Gallipoli when all of our colonels commanding brigades were to be promoted to temporary brigadier general. The promotions did not come through 'till July 1915, he had been killed on 27 April; his promotion was made posthumously. On Wednesday 5 of May 1915, a little over 101 years ago, the then Chief Justice of New South Wales, Sir William Cullen summoned together the judges of this Court. He stopped the Court's business at 10 o'clock that morning to convene a special sitting in the Old Banco Court. Sir William's purpose was simple: he wished to honour the sacrifice of Colonel Henry Normand MacLaurin, who had been killed by a Turkish sniper a week earlier. MacLaurin was not only an Army reservist on full time service. He was also one of Sydney's leading junior barristers. 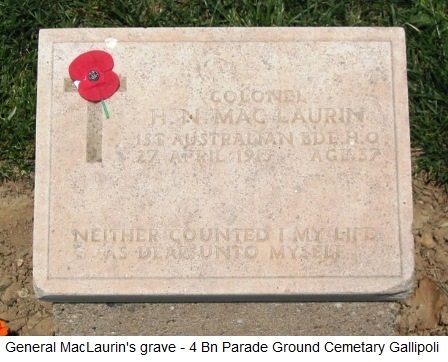 MacLaurin had died on 27 April 2015, barely two days after wading ashore with the first troops at Gallipoli. News of his death had just reached Sydney. MacLaurin was also one of the NSW legal profession's first casualties of WW1. His death had profound significance for everyone practising in Phillip Street. One example will suffice: Sir William Cullen would shortly have two of his own sons fighting at Gallipoli. That May 1915 Banco Court audience knew MacLaurin well. He was their friend-in-law. They already knew his story. Let me tell you that story now. MacLaurin was born in Sydney on 31 October 1878 into a family with a deep tradition of public service. He bore the same name as his father, Sir Henry Normand MacLaurin, a distinguished physician and conservative NSW statesman of Scottish descent. Sir Henry later became the Chancellor of the University of Sydney. MacLaurin Hall there still bears his name. Young Henry Normand was schooled by family choice, partly at Blair Lodge School, in Polmont, near Edinburgh in Scotland. But he completed his secondary education back at Sydney Grammar School, before matriculating to Sydney University. Foreshadowing his later energy and military disposition, MacLaurin was an active University student. Whilst studying for his Arts Degree he joined the Sydney University Cricket Club. He played in second grade over several seasons but with the occasional creditable performance in first grade. He enlisted in the New South Wales Scottish Rifles in 1899 at the age of 21. As was typical of the day, MacLaurin did not undertake a law degree but was admitted to practise after a further period of study and pupillage in law. MacLaurin progressed his legal and military lives in equal measure throughout his twenties and thirties. He was admitted to the Bar on 26 May 1904 at the age of 26. By then, after five years military service, he had already attained the Army rank of Captain. After four years at the bar and nine years military service, he was promoted to the rank Major. Even at a century's distance MacLaurin's life as a barrister sounds startlingly familiar to us. Here is Phillip Street looking South in about 1900, just a few years before he commenced practice. MacLaurin first took chambers at 93 Elizabeth Street and then moved to 151 Phillip Street. From 1907 to 1914 he practised from Wentworth Court, a building long demolished but which was located between Phillip and Elizabeth Streets, immediately to the South of what is now Frederick Jordan Chambers, at 53 Martin Place. When he left for war in 1914, he was about to turn 36. He had 10 years' experience at the Bar behind him. We would call him one of the "go to" junior barristers of his day. He was not just a junior showing promise. He was already very successful. He had the kind of varied junior's practice that suggests that his appointment as King's Counsel would probably not have been far away. He appeared in common law, in crime, in equity, at first instance and on appeal, including in the High Court. He had a strong mathematical and financial bent, appearing often in cases that required accountancy expertise. The law reports show the breadth of his practice. In November 1905 he appeared in a defamation case examining circumstances in which malice would defeat a defence of qualified privilege: Hay v The Australasian Institute of Marine Engineers (1906) SR (NSW) 30. In February 1912, he appeared in a criminal appeal, seeking to overturn the conviction of one Moir, by challenging the prosecution's comments about the failure of the accused to give any account of himself: R v Moir (1912) SR(NSW) 111. In April 1914, exactly one year before his death, the Commonwealth Law Reports show MacLaurin appearing as junior counsel to Adrian Knox KC in a constitutional dispute in the High Court of Australia in The Builders' Labourer's Case (1914) CLR 223, a case concerning the powers of the then Commonwealth Court of Conciliation and Arbitration. Long before war broke out MacLaurin anticipated and was preparing for possible conflict. Together with his good friend, the solicitor Major Charles MacNaughten, MacLaurin was, as the war historian of this period Tony Cunneen colourfully describes, "shaping the ragged clumps of inner city [Sydney] youth into functioning soldiers as part of the pre-war militias." News of the declaration of war reached Sydney at noon on 5 August 1914. Ten days later, on 15 August MacLaurin was appointed to the First Australian Imperial Force, given command of the 1st Infantry Brigade (of 1 Division) and promoted to the rank of full Colonel. MacLaurin must have already seemed a remarkable leader to his contemporaries. 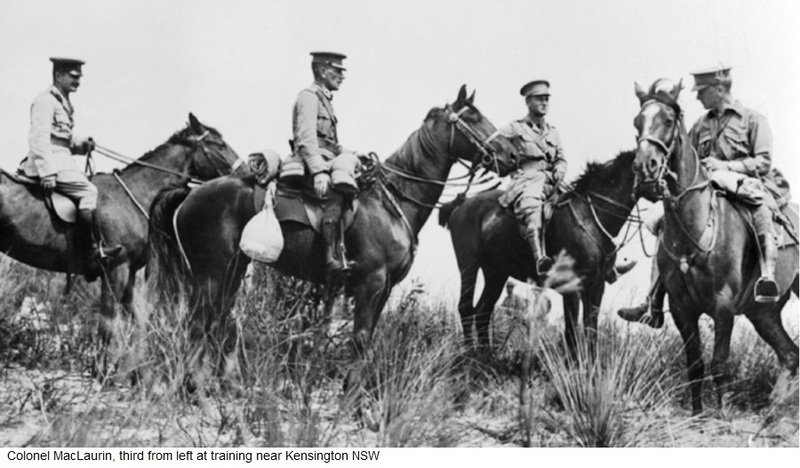 Australia's 1st Division was comprised of three Brigades. At 35 MacLaurin was the youngest of the Division's three original Brigade commanders. And within his own brigade he was more than a full decade younger than any of the four battalion commanders who were immediately subordinate to him. To blend some experience around the relatively youthful MacLaurin, Army's Senior Command posted into 1 Brigade as Brigade major, a veteran British regular Army officer, Major Irvine from the Royal Engineers. MacLaurin had just assumed an awesome responsibility. On 20 October 1914 two months after his appointment he led 1 Brigade, comprising 60 officers and about 1300 other ranks on board HMAT Euripides, bound for Egypt. What he achieved in those two months between his assuming command and the Brigade's embarkation is astonishing by any standard. Modern litigation is rarely prepared this quickly. MacLaurin had clear priorities. He scaled back his practice, returned his briefs and took direct personal responsibility for the final recruiting, training and appointment of the officers and men he needed to complete the force he now commanded. From his chambers and from the nearby Australian Club he actively built his Brigade of four battalions. He practised his men in the sand hills in the suburb of Kensington. He was photographed during these manoeuvres, controlling his men from horseback, together with a fellow Colonel Onslow-Thompson, the 4th Battalion Commander and his Majors, MacNaughten and Irvine. This photograph is a poignant reminder of 1 Brigade's sacrifice in war. Onslow-Thompson, MacLaurin and Irvine were all killed in action. MacNaughten was so often wounded he ultimately suffered a mental collapse. MacLaurin's 1st Brigade was ready. He marched them up and down Macquarie Street. Not surprisingly it was a pretty lawyer-friendly force. It embarked in October 1914 with a number of the solicitors that MacLaurin knew well. One was Hector Clayton, who would return from the war and later found the firm Clayton Utz. Another was Bertie Vandeleur Stacey who was articled to Dibbs, Parker & Parker and after the war became a barrister and a District Court judge. No doubt with the wisdom of having witnessed more than one legal disaster in his ten years at the Bar, MacLaurin showed a relaxed and tolerant attitude to the high spirited mischief of his men on their way to war. He recorded a positive view of their unruly behaviour in Cairo. In a letter back to one of the judges in Sydney he wrote: "with 20,000 men it can be seen that some would play up a bit while their money lasted…". He was keen for action. When the Anzac landing orders finally came through, the war historian Charles Bean records him as enthusiastically volunteering for detailed war planning in Cairo. 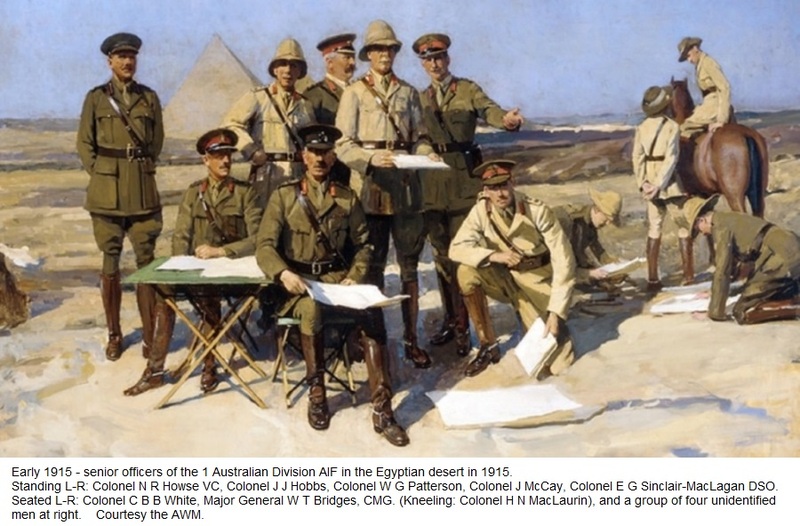 He is one of the officers in this painting of the 1 Div planning team in Egypt 1915. Charles Bean later described MacLaurin as "a man who showed himself a brave and energetic leader". This was no more evident than in the way he communicated with his men. He dispatched his final pre-battle message to 1 Brigade on 20 April, when they were garrisoned at Mudros Bay, on Lemnos. With blunt but inspiring words this is how he exhorted his men. TO THE MEN OF 1 BRIGADE "Men, - You are soon to go into action. Your training has made you fit for it and I have the greatest confidence in your courage and resolution. Just one word – keep a cool head, and listen to the fire orders of your officers. When you shoot, let every bullet find its mark; when you use the bayonet, see that you stick it in. Good luck!" But he had seen many enterprises go wrong, both in the court room and on the field. So, he had separate words of caution for his officers. What he told them has the flavor of a lawyer counseling a client about to be cross-examined. TO THE OFFICERS OF 1 BRIGADE "I want you to remember that upon you will depend the control of ammunition and water. It may be that some of the men will be excited at first and inclined to fire wildly. Check this. It certainly will be that some will endeavour to drink all their water the first day, and if they succeed they will surely wander off in search of more. Look to it, therefore, that this does not happen. Make your fire orders clear, keep touch and direction, and send in information of the enemy's movements. Above all, remember to keep cool yourselves. Good luck!" "1 (a) Troops will land in service dress. (b) Horses will be landed harnessed. (c) All entrenching tools will be landed under battalion arrangements. (d) All wire cutters will be carried. (e) All canvass water bags and receptacles will be taken ashore filled. (f) All vehicles will be packed before disembarkation. (a) Silence will be observed. (b) No one is to stand. (c) Rifles will be carried in the hand and not slung. (d) Rifles will not be loaded and magazines will not be charged. (e) Equipment will be loosened and shoulder-straps unbuttoned. (f) A military officer [ie Army] will be in the bows of each boat, and will be the first to land. (g) On arrival at the beach all troops are to remain seated until the naval officer or petty officer in charge of the boat gives the order to land." His officers and men knew exactly what was expected. Finally they arrived at Gallipoli. MacLaurin's Brigade was the last to come ashore. The pre-trial nerves of MacLaurin the barrister were as nothing compared with the anxiety of his long first day waiting for action. When 1 Brigade landed on the beach the chaos at the Australian's and New Zealander's ground zero was evident everywhere. The Commander of the ANZAC troops, Major General Bridges, was already ordering units, as soon as they arrived, to fill the growing gaps in the line. Working from the impromptu headquarters in the sands of Anzac Cove, shown in the foreground of this photograph MacLaurin ably managed 1 Brigade's first deployment. General Bridges sent 1 Brigade straight into one of the gaps he had identified, up near Steele's Post, in the central sector, due East from Anzac Cove. 1 Brigade were the last reserves available that day. MacLaurin's death 48 hours later was part of a 1 Brigade double tragedy: both MacLaurin, the Brigade commander and Irvine, the Brigade major, were killed within 10 minutes of each other. On the afternoon of 27 April Australian commanders feared a Turkish counter attack. Under MacLaurin's direction Irvine collected some 200 men who had dispersed from other decimated units, and was planning to send then forward. But news arrived that they were no longer required. So Irvine climbed up to Steele's Post to get a better view of the source of sniper fire coming from Russell's Top, an area across a valley to the North recently penetrated by the enemy, and somewhat behind 1 Brigade's position. He was shot whilst standing, surveying the enemy positions. MacLaurin was pinned down by the same enemy fire as Irvine. It is reasonably certain that he was unaware of Irvine's death when he too stood up in shirtsleeves on the Southern side of the nearby slope that to this day bears his name, MacLaurin's Hill. He too was trying to see the enemy on Russell's Top and to direct his men. A moment later he was shot from the same direction as Irvine, from about 300 metres across the valley. No one knows but the speculation at the time was that he may have been hit by the same sniper as Irvine. And like Irvine he died within minutes. In the final instant of his life MacLaurin was selflessly executing his duty as the doubleprofessional that he was. He was using his military and his legal mind to gather the evidence, to put himself in the best position to help his men and prosecute their cause. He was standing up, simply because he saw no other effective way to gather the intelligence he needed, to direct operations and to ensure his men stayed under cover. To our 21st century eyes MacLaurin was miserably equipped. He had no access to drone surveillance, no radar and no spy satellites. He had no radios to convey orders, merely his barrister's voice and little notes such as he would write in Court. He had no body armour to protect him against the worst. Without any of the support we would take for granted, he made the very bravest of choices: he chose to risk his own life rather than to ask his men to risk theirs. He volunteered to stand himself to survey the sniper-infested slopes of nearby Russell's Top. It was the last choice he made in this life. MacLaurin's immediate superior in command in Monash Gully, Colonel John Monash, felt his death keenly. Monash was a triple-professional. He had been an army reservist before the war, an engineer and a lawyer. By 27 April Monash's Gallipoli landing force of 4000 was already depleted to only 2300. Monash well appreciated and valued MacLaurin's special mix of experience and leadership and could ill afford such a loss. Monash reacted quickly. He immediately ordered his senior officers to avoid "unnecessary exposure". He lamented that such deaths would "seriously impair morale". In the terrible way of war, MacLaurin was buried within metres of where he died soon to be known as "MacLaurin's Hill". Some weeks after his death, brigade commanders were upgraded from colonels to brigadiers general. He was posthumously promoted to the rank of brigadier general (promotion dated 10 July 1915 - he had been killed in action 27 April 1915). In 1919 his grave was moved into the 4th Battalion Parade ground cemetery. But his legal and military friends remembered the alert, energetic and thoughtful figure. ... "
Rear Admiral The Hon Justice MJ Slattery RANR Rear Admiral Slattery was appointed Judge Advocate General of the Australian Defence Force in July 2014. As Judge Advocate General – ADF he exercises defined functions under the Defence Force Discipline Act 1982 in relation to the operation of ADF discipline, upon which he reports annually to each House of Parliament. Slattery was born in Sydney in 1954 and graduated from the University of Sydney in Arts in 1975 and in Law in 1977. He was admitted as a barrister in 1978, made a Queen's Counsel in 1992 and appointed a Justice of the Supreme Court of New South Wales in 2009. Slattery joined the Royal Australian Navy Reserve as a Lieutenant (Supply Branch – Legal) in 1990. He was promoted Lieutenant Commander in 1996, Commander in 2000, and Captain in 2006. Upon his respective appointments as Deputy Judge Advocate General – Navy in 2010 and as Judge Advocate General – ADF in 2014 he was promoted Commodore and then Rear Admiral.